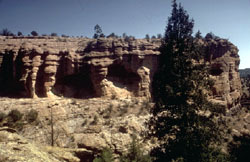 Gila Cliff Dwellings National Monument preserves cliff dwellings and other significant archeological remains left by prehistoric American Indians of the Mogollan Culture. The well preserved cliff dwellings, constructed in the late 1200s, contain 42 rooms and are located within five natural caves in a narrow side canyon above the Gila River. 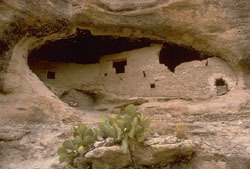 The TJ Ruin contains unexcavated remains of a small pueblo inhabited for roughly 900 years beginning c. 500 A.D.
Gila Cliff Dwellings National Monument, administered jointly by the National Park Service and the Forest Service, is 44 miles north of Silver City, New Mexico, at the end of NM 15. During the summer, the cliff dwellings trail is open from 8:00a.m. to 6:00p.m., and the Visitors Center is open from 8:00 a.m. to 5:00 p.m; the rest of the year, the trail is open 9:00a.m. to 4:00p.m., and the Visitors Center is open 8:00a.m. to 4:30p.m. Please call 505-536-9461, or visit the park's website for further information.